When you’re in need of faster fast food, Foodida wants to be there for you. The company is creating an on-demand community that can deliver food when you order it. Or you can go to a fast-food place on your own and pick up someone else’s order to deliver to them, earning you some money that essentially pays for your food. If it works, this could transform what “fast food” means in the $ 200 billion quick service industry. 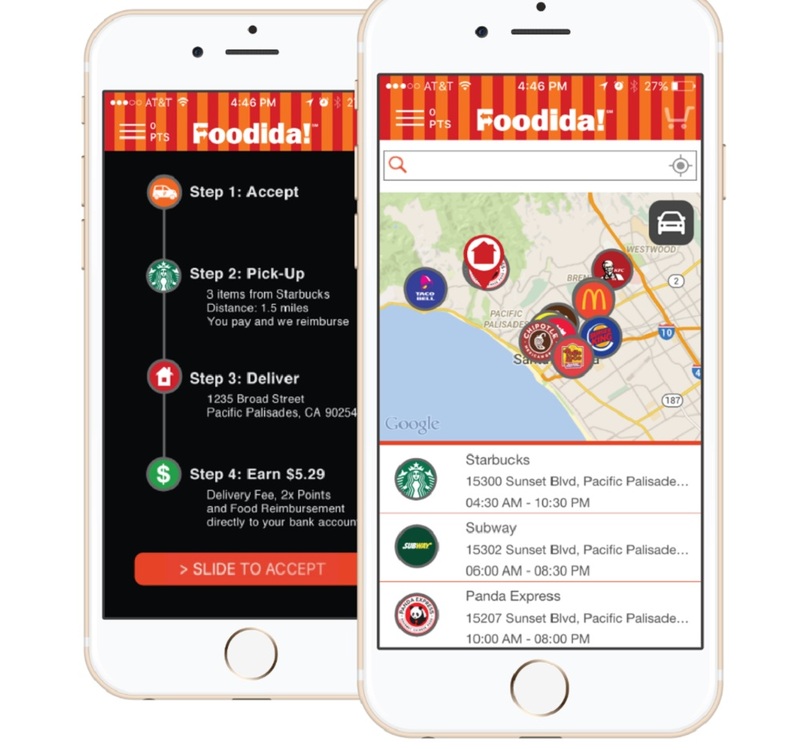 Foodida has launched its service in select communities in Los Angeles. That means that you can order fast food through Foodida and then crowdsource the delivery. If a community member responds, he or she will pick up the food and deliver it to you. You pay a fee, which goes to the delivery driver and to Foodida. This gets fast food to the person who wants it and some extra money to the person delivering it, said Stefan Fraas, CEO of Pacific Palisades, Calif.-based Foodida, in an interview with VentureBeat. “We are a community that allows everyone to either order food or make money doing a delivery with one seamless app experience,” Fraas said. The company has launched in Santa Monica, Venice, Thousand Oaks, and the San Fernando Valley — all suburbs of Los Angeles. But the company isn’t just an Uber for fast food. In the Uber model, there’s a master-servant relationship. One person is the customer and one is the driver. But with Foodida, everybody can serve someone else or be served. Above: Foodida enables faster fast food. Under this model, a lot of people can make occasional deliveries while getting their own food or while out on other errands, rather than fewer people doing a lot of the deliveries, Fraas said. In addition, the community is likely to be more personal. That’s because people are not going to go out of their way to make deliveries. Rather, the closer the delivery is to their own home or work, the more likely they are to undertake the delivery. You simply make yourself available and claim an order on the app when you want to make a delivery. Customers can also make multiple orders, stringing together a Starbucks latte with a Big Mac. This kind of efficiency keeps the price of the delivery fairly low. Healthy or not, roughly 80 million Americans eat fast food, and Fraas said that in a five-square mile area of the San Fernando Valley, there were 32 Subways, 24 Starbucks, and 22 McDonald’s. Above: Foodida is counting on densely packed neighborhoods for fast delivery. Fast food is craving-driven. And sometimes you might have to pay a little more to get it at a particular time of day. If you place an order at 1 a.m., you might pay more if there aren’t that many delivery people available. There are rivals to this service, such as Door Dash, but they make deliveries of all kinds and include unique restaurants that might be farther away. That makes driving distances likely to be longer and delivery times longer as well, Fraas said. Foodida is raising a round of funding now, and it hopes to roll the service out to larger areas soon. Foodida was founded last year, and it launched its first test market in October. It then launched in Santa Monica, Calif. in January. It has about 15 employees. The beauty of the system is that it doesn’t really take a ton of effort to add new delivery drivers or restaurants in new territories. And, hopefully, the next service we’ll get is on-demand exercise.